Today marks the start of a new Friday feature called Tasting Room. A complement to Friday's Winery Watches, these posts will include reports of current releases from a particular winery. In some cases they will be the current releases of a winery I've written a Winery Watch profile on in the past. Sometimes, they will cover wines made by negociants or folks who draw from a variety of vineyards all over California and the world. In other cases, I will have had the opportunity to taste a complete line-up of the wines and just want to get brief reviews out to you as quickly as possible. Enjoy! If you find yourself in or near the town of Healdsburg, be sure to visit the friendly tasting room of Toad Hollow Vineyards. Toad Hollow was started by Todd Williams and Rodney Strong, two men with a passion for making world class wines at affordable prices. The wines that I tasted when I visited certainly lived up to that mandate. 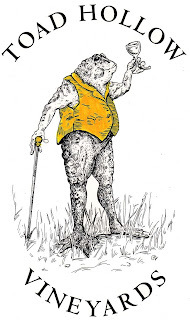 I've already reviewed a Toad Hollow wine for WBW #36, a delicious unoaked chardonnay. Today I want to share my other tasting notes from that visit. To find these Toad Hollow wines at a retailer near you, click on their interactive map for distributor and retailer contacts. 2004 Toad Hollow Cabernet Sauvignon Concinnity (purchased at the tasting room for around $17; no other merchant information available). A new world red blend made in an old world style. Rich red fruits lie underneath green herbal and pepper notes. Contains cabernet sauvignon, petite sirah, syrah, and cabernet franc. Limited production. Very drinkable. Will appeal to those who like a more restrained and less extracted cab, but find Bordeaux TOO green. Nicely balanced, nice finish. Good QPR. 2005 Toad Hollow Pinot Noir Goldie's Vines ($20 at the tasting room; under $25 at other merchants) Extremely good pinot noir made from Russian River Valley fruit. Abundant, bright red raspberry fruit is balanced out with toasted oak. There are dusty tannins and earthy notes to add to the complexity. Very good QPR. 2004 Toad Hollow Merlot Reserve Richard McDowell Vineyard ($18 at the tasting room; under $20 through other merchants) I loved this beautifully made merlot from Russian River Valley fruit. 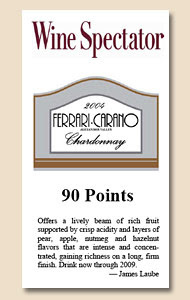 It is rich, robust, and fruity with a core of currant, clove, and caramel aromas and flavors. Accented by vanilla and toast, this wine will please any big red wine drinker. Not a wimpy merlot by any means. Excellent QPR. N.V. Toad Hollow Erik's the Red (between $10 and $15 from most merchants) Paso Robles grapes go into this surprisingly good blend of 18 grapes. Priced perfectly to accompany your pizza, it is a smooth drinker, with nice acidity, and not at all mushy. Cab Franc provides interesting herbal aromas, zinfandel lends its blackberry fruit to the mix, and petite sirah's richness and body lend lushness to the blend. At the same time there is a definite softness to the wine (probably from its pinot noir, grenache, and dolcetto grapes) as well. Great house red candidate. Excellent QPR. N.V. Toad Hollow Limoux Risqué (under $15) . Made with French grapes, this light and delicate sparkler is sweet and meant to go with dessert. This is a cake wine, with only 6% alc/vol and a nice balance of acidity to counteract the sweetness. Light lemon aromas and flavors, with lots of honeysuckle impression. Try it with coconut cake, angel food cake with berries. Very good QPR. It is a sad, sad task for me to add to this post the news that one of Toad Hollow's founders, Todd Williams, passed away in Santa Rosa on August 14, 2007. Todd Williams was a great believer that everyone deserved to drink good wine, even those on a budget. He was also a believer in giving back to this community. Donations can be made in his memory to the Boys and Girls Club of Healdsburg, and to the Norma and Evert Person Heart Institute at the Santa Rosa Memorial Hospital. He will be missed. Early Harvests a Sign of Climate Change? In France's Beaujolais region the harvest of gamay grapes began 2 weeks earlier than usual, something that veteran winemaker Georges Duboeuf remembers happening only a handful of times in his life. In 1947, 1976, 2000, 2003, and now in 2007 the harvest came in early. What he doesn't say is that three of those harvests have been within the last decade, which I find a bit alarming. Despite the early harvest, there are no plans to change the release date for beaujolais nouveau, which is still planned for the third Thursday in November. 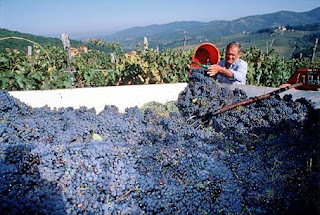 In Sicily, the Veneto, and Lazio there are similarly early harvests this year, with grapes being picked as many as four weeks earlier than usual. This had led to problems securing workers for harvest, and to changes in long-established traditions like harvest festivals that typically take place in October--not September. Harvests are always idiosyncratic and quirky, and 2007 will be no different. Bordeaux has been worrying about rain, not heat, for instance. And Napa has had few of the high temperature spikes that can lead to uneven ripening of the grapes. But this rise in temperatures across Europe does have viticulturalists worrying about the long-term effects this may have on wine production. Entirely new varieties may need to be planted to cope with the climate change. And the higher heat is producing fruitier wines which will only contribute to the trend towards "international" fruit forward styles. I don't know about you, but this is not a trend I applaud. I like wines to taste different, and to reflect the conditions under which the grapes were grown and made. I've always thought whether and how much to let fruit ripen on the vine was a decision of the winemaker. Now we see that Mother Nature has a role in the decision process, too, and if global warming continues, we may all be in for a far fruitier future than we thought. Post-Script, 8/31/07: The San Francisco Chronicle's Lynne Charr Bennett reported on the earlier harvests taking place all over California this morning, adding coverage on Lake County, Monterey, and San Luis Obispo along with other viticultural areas. If you drink wine with dinner each night, there is a very good chance that you prize the versatility of your wine almost as much as you prize its high quality or its fair price. So many blockbuster wines are actually quite difficult to pair with food, and I personally find cabernet sauvignons a real challenge because their powerful flavors can so easily overwhelm everything else that you have on the table. Enter sauvignon blanc. Like pinot noir, I find that sauvignon blanc is an acceptable pairing with most fish and poultry dishes, works alright with salad, can be a blockbuster with certain cheeses, and suits most people's palates. 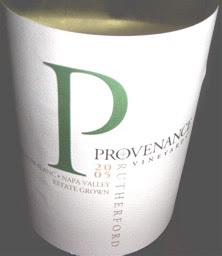 It is also fairly easy to find really good wines made with the varietal for under $20, like the 2005 Provenance Vineyards Sauvignon Blanc ($16.99, Beverages and More). This was an outstanding sauvignon blanc that was far less tangy and grassy than those that you might have enjoyed from New Zealand and therefore was even easier to pair with food. While it was rounder and richer, it did not have a pronounced oak taste of a fume blanc, either. The wine was a beautiful pale gilt in color, which added to the enjoyment, and had muted aromas of lime, lemon and grapefruit. Flavor-wise, I detected peaches, lemon and also kiwi--a real fruit bowl that ran the gamut from tangy citrus, to tropical kiwi, to rich orchard fruits. One of the things I liked best about it was its silky texture and medium body, which gave the wine a really rich mouthfeel. I did a little research and discovered that this wine had seen time both inside a barrel and inside a stainless steel tank, which did a lot to explain both its roundness and its fruit-forwardness. Even though it was outstanding, this wine may cost you a bit more than you're used to in sauvignon blancs, so I consider it a very good QPR choice. One of the great things about being a wine blogger is you are always on the look out for new wines to write about, and new regions to explore. This year I've tried to focus on getting to known Spanish and Burgundian wines in order to expand my palate and wine knowledge. I've loved every minute of it. But, as Tyler Colman pointed out in his list of the pros and cons of wine blogging in Wine and Spirits magazine, the upside of exploration has a downside: you drink less of your favorite wines. I just got a big reminder that I love Rhone wines. Whites, reds--doesn't matter. Bring them on. I love syrah, grenache, mourvedre, grenache blanc, roussanne, and marsanne. And I could go on and on about the Rhone blends that are so drinkable, and yet so complex at the same time. The Rhone has its expensive wines, to be sure, but it also has bargains and those bargains often come under a Cotes du Rhone label. These wines are grown in vineyards that fall outside of the more famous named appellations like Crozes Hermitage, Cote Rotie, and Chateauneuf du Pape. As a result, they are often less pricey than their better-known neighbors. 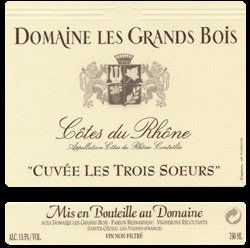 They often represent excellent QPR, too, like this 2005 Domaine les Grands Bois Cotes du Rhone Les Tres Soeurs ($9.95, Chronicle Wine Cellar; available from other merchants for between $10 and $15). Let me say off the bat that this was a lot of wine for under $10. A rich ruby color made the wine look as luscious as it tasted and I was eager to get my nose into the glass as soon as I had poured it. The wine was blended from 60% old vine grenache, 30% syrah, and 10% carignane, producing a wine that had abundant aromas of berries, herbs, and spice. These are the classic hallmarks that I associate with the grenache varietal. Berries and herbs continued through the flavors, with that distinctive brushy-dusty-herbal flavor that is known as garrigue and always reminds me of country lanes in the height of summer. Underneath it all was a Rhone funkiness of earth and leaves, and it ended with a mouthful of spice. This was a really good, classic, and drinkable Rhone wine. It was the kind of wine that would go as perfectly with roast chicken as it would with chili or stew. And it was a reminder to me that sometimes you just need an old favorite to bring your day to a satisfying close. With all that's going on this time of year, it may be a few days before I get on a regular posting schedule, so thanks in advance for your patience and I'll see you back here as soon as I'm ready to meet my classes and have located the top of my desk. I've been getting to know Spanish wines this year, and have had some excellent whites and some flavorful reds, too. I was struck at this week's Family Winemakers tasting by how many domestic producers are starting to plant Iberian varietals from Spain and Portugal, and how good the wines can be. Tempranillo seems to be the favorite Iberian varietal among US producers at the moment, but you see others as well, including verdelho and albarino. I recently had an extremely good Albarino grown in the wilds of Mendocino County. This area is known for sparkling wine, pinot noir, and chardonnay so I was delighted to find a Spanish grape tucked into the mix. This counted as drinking local for me, since the grapes were produced at Eaglepoint Ranch Winery just up Highway 1 and a right turn on Highway 128 away from the coast. The 2006 Eaglepoint Ranch Albarino ($18, direct from the winery) was a real surprise, with its exciting aromas of almonds, apples, and citrus. I've never been able to smell any almonds in an albarino from Spain, even though it's a hallmark of the varietal, so when I got that decided whiff of nuts I was hopeful that the flavors would be a fitting follow-up. Made with organic grapes, there was a little bit of spritz when the wine was first opened, but this quickly dissipated leaving a lively still wine. It had great acidity, but the mouthfeel was rounder than many of the Spanish versions of this varietal that I've tasted. To me, this tasted less tangy, with the citrus taking a decided back seat to the almonds and apples. We had it with roasted chicken and a big summer salad, and that roundness came in handy with the lemon and rosemary that flavored the first, and the herbs and vegetables that filled the second. Only a few cases were made of this wine, and it costs a bit more than the entry-level Spanish albarinos you can easily find at the big chain stores. But if you love albarino I'd heartily recommend you contact the winery and see if they can send you a bottle or two or three of this very good QPR wine. Yesterday I attended another great Family Winemakers Event--this time in San Francisco. It was a warm day, with a good breeze off the bay, and folks came in large numbers to taste the wine and to talk to the California family winemakers who have such a passion for what they do. This was one of the first trade tastings I've been to where I actually had friends I wanted to see, like the people at Fort Ross, Anglim, Tablas Creek, Four Vines, Twisted Oak, and Ballentine. That slows down your progress a bit! But it was great to see the big crowds gathered at their tables, even when it meant that I never got to talk to them because they were too busy pouring and talking about their wines. I also got to meet Tim Elliott of Winecast (pouring some wonderful Goosecross Wines) and Marshall Sontag of WineQ. There will be lots to write and talk about in the upcoming weeks, but here are a few random highlights in no particular order. Go-To Wine Finds: I focused in this tasting on finding good value wines that were exciting and represented nice value across the board. I found some, too. Labels like McManis, Roshambo, and Hook and Ladder all delivered consistently high quality at very good prices. If you see one of their wines, don't hesitate to buy it. New Winery Find: I tasted my first wines from Barreto Cellars, a Central Coast winery specializing in Spanish and Portuguese varietals sourced from vineyards throughout the state. I thought their wines were terrific, with surprisingly lush flavors and (with the exception of their big bottles of port) not a bottle over $23.99! Biggest Kick: Seeing Fort Ross Vineyard's just-picked grape clusters arranged on a platter. I had the privilege of seeing this grapes on the vine just a month ago when Linda Schwartz generously took me through the vineyards. A month later, the tightly compacted and tiny cluster of pinot noir and chardonnay had come a long way in color and size. I can't wait to taste the wines that will be made from them. Favorite New Reds: the 2004 Barreto Cellars Touriga, made with two Portuguese varietals sourced from the Silvaspoons Vineyard in Lodi, was a definite winner. And I loved the funky, spicy blend of Zinfandel and Primitivo that went into the big 2005 Goosecross Zinfandel/Primitivo bottling. I couldn't find any information about this wine on the site, but if Tim sees this maybe he'll give us the information. As I recall it was between $30 and $40. Favorite New Whites: the 2005 Core 613 White Blend (around $20), made from Rhone varietals grenache blanc, roussanne, and marsanne, was delightfully crisp with aromas and flavors of peach and melon. And the 2006 Tablas Creek Vermentino (available at the winery for under $30) was a surprisingly round example of the varietal, with honeydew and pear flavors and lots of aromatics up front and a juicy finish. Biggest Bargains: For just $13.99 you can get a Bordeaux-style cabernet sauvignon from the Sonoma Coast in the 2005 Soper Winery Gualala River Cabernet Sauvignon. Full of cassis and herbal notes, this reminded me of a French wine in style and substance. If you're looking for a big wine for a small price, look no further than the 2006 McManis Petite Sirah, with its rich espresso and cocoa powder flavors dusted over red fruits for between $9 and $12. Hook & Ladder's 2005 Chardonnay was also a steal for $16, given its crisp golden delicious flavors and aromas and its clean, round finish. There will be more details in the coming weeks on these wines and more. If you've never attended a Family Winemakers event, check out their website and put yourself on the mailing list. They're a lot of fun, and you will get to taste a wide range of great California wines in one place. Australia's Clare Valley is best known in the US for producing flavorful, elegant rieslings. North of Adelaide and west of the Barossa Valley, the Clare Valley has warm days, yet produces wines that are reminiscent of those grown in cooler climate areas of Europe. 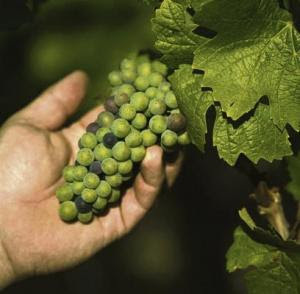 Though riesling is the most heavily planted grape in the area, the Clare Valley does take advantage of the climate to grow other grape varietals as well, such as shiraz and cabernet. Because the region is only beginning to be known for its reds, Clare Valley red wines can represent excellent values, especially when you compare them to their cousins over in the Barossa Valley. 2003 Kilikanoon Cabernet Sauvignon Block's Road is an example of just how good a red wine from the Clare Valley can be. (Chronicle Wine Cellar, $19.95; available from other merchants for under $30). Last year I bought a bottle of this wine, and pulled it out when I peeked into my wine cellar/windowseat this summer. This wine is still relatively young, and could last another 2-3 years in the bottle under good conditions, but it is already drinking well. It is a smooth wine, with well-integrated tannins and fully developed flavors of cassis, herb, and black pepper. There are some richly smoky notes on the finish, which adds some nice complexity to this opulent, lush wine. Despite its decided cassis flavors, this is not simply a fruit bomb--there is a good acidic structure at the core of this wine, which is why it is aging so nicely. This is a lot of cabernet for under $20, and represents very good QPR. To go with this wine think of something flavorful and meaty. We had orzo tossed with mint pesto, fresh tomatoes, feta cheese, grilled artichokes, and topped with grilled patties made out of a combination of lamb and sweet Italian sausage that had been removed from its casing. This minty lamb and sausage orzo was just delicious with the cabernet, since the minty pesto and vegetables combined nicely with the herbal notes in the wine and the smoky edge picked up the char on the artichokes and the meat patties. This wine was a great reminder for me that sometimes it's not the varietal that sets the price. Cabernet can be expensive, especially when it comes from a region like Napa Valley or Bordeaux known for the grape. But if you look for cabernet grown in a region known for something else, you could be in for a bargain and a treat. Lenn Thompson of LENNDEVOURS has just posted the roundup of naked, unoaked chardonnays from the August Wine Blogging Wednesday. Despite celebrating the 3rd anniversary of his own blogging event with a back injury, he still managed to pull together an impressive list of posts from around the blogosphere. Thirty-two bloggers participated in the event (drats, I'd hoped for a symbolic 36) and many tasted more than one wine, so there's lots of good information hot-linked for you if you are a chardonnay lover. Folks tasted wines from New Zealand, Australia, the US, Spain, and France. I was particularly interested in the wide range of French wines reviewed. And there were some great wines from New York and Virginia, just going to show that US chardonnay isn't just from California! See you back here on September 12 when we go native with Dr. Vino for Wine Blogging Wednesday #37. Meanwhile, thanks to Lenn for his inspired leadership and for going the extra mile to get this roundup posted. Wine Blogging Wednesday enters its fourth year by going native. Dr. Vino set the theme for the September online tasting, and he wants us to pick a region and drink a wine made from a grape indigenous to that region. And don't think this means you can't drink a US wine--the US is the native land of quite a few varietals. He's posted some resources to help you discover what grapes are native to your area--or an area of wine that you know well, or want to get to know better--so click over there to check them out if you don't have something in mind already. Sometime between now and September 12, pick your region, find your native varietal, and drink a native wine from that region. Then blog all about it on Wednesday, September 12 and . If you don't have a blog, no worries. Just head over to the Wine Blogging Wednesday site and enter your tasting note there in the forum. Lenn Thompson, the host of WBW #36, injured his back and hasn't been able to sit down at the computer long enough to gather together the round-up of posts for the August tasting. When he does, I'll be sure to let you know. Wine storage is always a problem, as any dedicated oenophile knows. 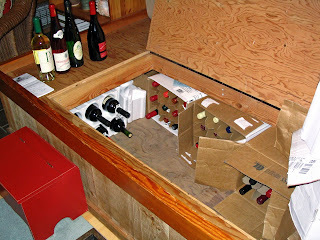 Know matter how small your collection, or how big your house, there never seems to be enough space to stash all of your wines in cool, dark comfort until you're ready to drink them. In previous posts on cellaring wine I mentioned that I have a passive cellar in the north-east facing windowseat of a house on the Sonoma Coast. I had a wine-loving friend to lunch one July and he came into my chilly house tucked into the redwoods and said, "Ideal cellar conditions." I emptied out a windowseat, and refilled it with empty wine boxes, styrofoam wine silos, and six-bottle carriers from winery visits. Then I filled up all the holes with wine. It's not elegant, as the picture shows, but it works. This summer, I've had a chance to pull some wine out of that windowseat and drink it and every bottle has been in perfect condition. I have been reminded that I really, really like older cabernet. Not old, but older. Like the 2001 Three Saints Cabernet Sauvignon from Santa Barbara County. I can't find a single bottle of this wine anywhere, and I was sorry I had only one bottle. I bought it last year as a bin end for $12.50, tucked it away and forgot about it. Nine or ten months later, it is a testament to how beneficial even short-term cellaring can be, if the conditions are right. When I opened it I discovered that it was a beautiful example of a California cabernet. It had a dark, inky purple color to it and aromas of blackberry, plum, espresso--and cedar, the unmistakable smell to my nose of a cabernet with bottle age. A cascade of blackberry, grilled herb, and dark chocolate were a prelude to the lingering aftertaste that was accented by cinnamon and spice. It was drinking pretty well for a wine that it still within its recommended drinking range, and while it may keep improving for another year or two I was glad that I had it in its "middle age." I pair wine with food all the time, and am usually happy when the food and wine don't clash, or when the wine picks up a few elements in the food (or vice versa) that make for interesting flavor compatibilities or contrasts. But sometimes you find a pairing so perfect that you are just blown away by the synergy created between the food and the wine. I just found a pairing so perfect that I'm still trying to figure out what happened a few days later. The pairing started with a bin end that I picked up in my small coastal town's independent grocery store. It was on a massive reduction, so I decided to try it. 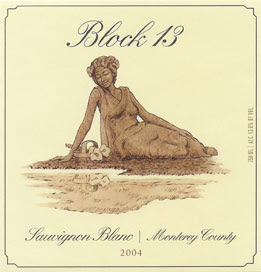 The 2004 Block 13 Sauvignon Blanc is a non-estate label from the legendary Gundlach Bundschu winery. ($8.99 in a bin end here on the coast; available from other merchants for between $14 and $20) It was unlike any other sauvignon blanc I've had, with aromas of key lime pie, ginger, and mandarin orange. Hmmm. What could I make that would go wit that? The flavors on the palate continued to develop along spicy, tropical lines with citrus fruits, a distinctive note of ginger, and juicy passionfruit. Despite all the tropical elements of the wine, it was very fresh and zingy. For under $10 this was a sauvignon blanc with excellent QPR (and even for $14-20 this would be a very good QPR choice). Still, the flavor and aroma profile of the wine was going to make it a challenge to find a recipe to go with it. Or so I thought. I needed to find something light and zesty, with tropical fruit and spice. Surfing through myrecipes.com, I found the perfect dish in a salmon and "forbidden rice" salad with loads of ginger and lime, and big chunks of mango. As soon as I read the ingredients I knew that this would work with the wine, but I had no idea that it would achieve pairing perfection. It did. And it was healthy, low-calorie, and good for you. Who could ask for more? Pairing wines is always a trial and error process, and it takes experience and quite a bit of luck to get it right. Have you had a perfect pairing lately? If so, let us know what it was in the comments. 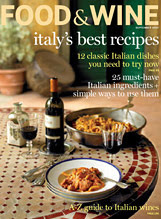 I just picked up the September 2007 issue of Food and Wine Magazine, and it is a must buy if you are interested in Italian wine and the food that goes with it. If you aren't a subscriber you should try to pick it up when you go grocery shopping next time, as nearly every recipe and wine mentioned had me running for a pen and paper to copy down the ingredients, or to jot down the name for my next wine shopping spree. There are some great features in this month's issue for winelovers. First, for bargain hunters like you and I, Ray Isle rounds up the 25 Best Italian Wines Under $25, including the 2005 Fattoria le Pupille Morellina di Scansano ($19) and the 2005 Feudo Arancio Nero d'Avola ($9). Both of these wines are excellent values, and use varietals that are native to Italy. Ray Isle also selects six budget-friendly barberas to go with some mouth-watering recipes. For varietal fanatics (I fit in that cateogory) there is an A-Z primer of Italian wine grapes that is a superb overview of the wide range of drinking options. There's a lot more than sangiovese to sample, that's for sure, like fiano and aglianico. Lettie Teague explores whether Barolo is all that it's cracked up to be--especially the new "modern" style wines. And Chang-Rae Lee remembers a very special Italian wine that she'd swap her best brunellos for if given the chance. I've hot-linked the highlights here, but there are loads of food and wine pairings that steer you to even more Italian wine finds so do pick up a copy and get cooking, sipping, and enjoying all that Italy has to offer. I don't know as much about Italian wine as I'd like to, and the September 07 issue has inspired me to learn more. The so-called "dog days of summer" ended on August 11, marking the astronomical turning point of the summer season and our tilt towards fall. The last best BBQ weather is upon us, and even if you can BBQ year round as we can in California, somehow food from the grill always tastes better in summer. I don't know how much they BBQ in France's Languedoc, but I found a perfect wine from that region to go with your grilled foods. The 2003 Chateau de Caraguilhes is a fun, old-fashioned grenache-based blend with a little bit of syrah, carignan, and mourvedre in the mix. ($10.99, Mission Wine) It's a bit rustic and rough around the edges, with all kinds of warm herbal and brushy notes up front in the aromas. These mouth-watering summer smells are followed by ripe, blackberry fruit and a lingering aftertaste of dusty and grilled herbs. The ripe fruitiness underneath comes through at the very end, keeping the wine balanced and making it utterly perfect for BBQ. This robust wine is unfiltered, so expect it to throw a little sediment, or expect to decant it if this bothers you. I thought this wine represented excellent QPR at just a hair over $10, as it was richer and more complex than many reds at this price-point. And it's organic, to boot. As for foods to pair with it, it would be as good with simple grilled chicken as it would be with BBQ ribs slathered with a spicy tomato sauce, burgers, hot dogs--you name it. 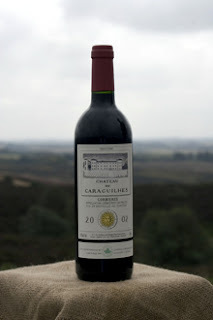 Chateau de Caraguilhes is a historic wine chateau located in the Corbieres district of the Languedoc-Roussillon wine region in southern France. The tradition of grape-growing and wine-making extends back to Cistercian monks in the 12th century. The chateau was a pioneer of organic agriculture, and the vines have been farmed without chemicals or pesticides since 1958, a tradition that continues today in this certified organic winery. I tried a white from the Languedoc for WBW #33, and did not like it as much as I had expected to given the reds I've tasted and enjoyed. But this wine didn't disappoint, and confirmed my sense that if you like robust reds, you should keep your eyes out for wines from the Languedoc-Roussillon. This week we've been celebrating the 3rd anniversary of the wine blogosphere's most popular event, Wine Blogging Wednesday. The theme for this month's tasting was unoaked chardonnay, and I decided to feature unoaked wines all week. First up was an unoaked pinot noir, then an unoaked chardonnay. But what celebration would be complete without a little sparkle? Most sparkling wine undergo some time in the barrel, but there's one sparkler that never seems to get wooded, and that's sparkling moscato. This is not a big, complex, bubbly wine. Nor is it a dry wine. But if you are looking for something off-dry and slightly sparkling, moscato can be a very good choice. Made from the muscat canelli or moscato bianco varietal, the most famous are made in the region surrounding Asti, but I tried a local moscato made in Mendocino County, and it had very good QPR. The 2006 Enotria Moscato (available from merchants for between $12 and $15) is made by the Graziano Family of winemakers. The wine is a pale, watery gold in color and as with most well-made moscatos, the first thing that hits you are the aromas of flowers and citrus fruit. The flavors of peach and lemon accent these wonderful aromatics which fill your head with every sip and transport you to summer, no matter what time of year. This wine is off-dry, but a strong core of acidity kept it in good balance. Its slight effervescence was not as fizzy as Italian versions of this wine that I've had. With only 10% alcohol by volume it can serve as a stand-alone sipper or as a dessert wine. I can't honestly think of a good food option, with the possible exception of peach cobbler. It would be fantastic with that. I just drank it on its own, and enjoyed every mildly intoxicating sip. In addition to its low alcohol, a moscato like this is perfect for summertime drinking because it benefits from having a good chill. If you are sweating in the summer heat, try to find a bottle of this refreshing wine, pop it in the fridge for an hour, and then sit outside in the evening and sip a glass. Instant coolness. Happy Birthday, Wine Blogging Wednesday. Here's to a great 4th year, and many more years to come. Believe it or not, the first grapes of the 2007 Napa Valley harvest were picked two days ago at Mumm Vineyards. Grapes throughout the valley are taking on color (known as veraison) and ripening evenly and slowly. This should lead to wines that are balanced and high in tannins--in other words, wines that should age exceptionally well. Unfortunately for bargain hunters, this year's crop will probably be smaller than last year's by about 10%, which should keep cabernet prices in the upper price brackets. And if the harvest is this good, the demand for the 2007 wines will be steep. The last time I bought Napa cabernets in a systematic way was in 1997--a long time ago, now, but it was a vintage that was also heralded as a classic. I still compare cabernets I drink today to the increasingly hazy memories I have of those made from grapes harvested in 1997. I can't remember a single maker, I just remember that every 1997 cabernet I tasted was better than the last. If you are a cabernet lover, I'd start praying to the Wine Gods for the weather to hold, and start saving up your money now, too. Get on a few allocation lists if you can afford it, and wait for the madness to begin in a few years time. Welcome to the 3rd Anniversary of Wine Blogging Wednesday, the online tasting event dreamed up by Lenn Thompson of Lenndevours, who is (appropriately) hosting this special birthday edition. Dedicated to "naked" or unoaked chardonnay, it's a tasting that I've been looking forward to because these wines made me rethink what had become a strong aversion to the varietal. Turns out it wasn't the chardonnay, but the style of chardonnay that was the problem. After years of feeling like I'd drunk a bucket of overly buttered popcorn and followed it up with a mouthful of toothpicks, it was a delight to have winemakers step away from the oak and let the varietal characteristics of the grape shine through. While it was hard to find unoaked chardonnay in the past, it is becoming more and more common to see "naked," "unwooded," and "unoaked" on labels these days. I wanted to drink something local and historic for this month's event, and so my choice was easy: the 2006 Toad Hollow Francine's Selection Chardonnay from the Mendocino County AVA ($13 direct from the winery's tasting room in beautiful downtown Healdsburg). Toad Hollow founders Todd Williams and Rodney Strong saw that the future of chardonnay was unoaked back in 1993, when everyone else was making oak chip tea bags and going for new American barrels. The Mendocino County fruit that provides 90% of the grapes for this wine helps to keep it focused, and provides enough acidity to provide a good structure for the fruit. That's because the swings between warm days and cool nights in Mendocino County helps to keep the fruit from over-ripening. The remaining 10% of the juice comes from Sonoma County. I found the 2006 Toad Hollow Francine's Selection to be a fresh and lively unoaked chardonnay, that smelled of golden delicious apples. Soft and food-friendly, there were apple and citrus flavors that were never harsh or acidic because the juice underwent 100% malolactic fermentation in stainless steel tanks and was left on its lees for 8 months. The result was a wine that had a full-bodied mouthfeel without the oakiness. At 13.7% alc/vol, I was surprised to get a little bit of alcoholic heat in the aromas and a bit of afterburn in the finish. This is a new release, and I wonder if the wine still needs to settle down a bit. What will it be with 6-9 months of bottle age, because giving it a little time to open up really diminished the alcoholic sensation? Very good QPR for a wine that was easy to drink and easy to pair with food. Toad Hollow Vineyards was started up by friends Todd Williams and Rodney Strong. Their motto is "fine wine at a reasonable price" and I certainly felt they lived up to that with this bottling. Their 2006 unoaked chardonnay was just released a few months back, so keep your eyes open for it in your local wine stores this fall. Thanks to Lenn for hosting, and for getting us into all this trouble--I mean fun--with his Wine Blogging Wednesdays. As usual, I'll let you know when the roundup is posted and when WBW #37's theme is announced. But there is evidence that the influence of the major magazine's points-ratings and the handful of major critics who write them is beginning to play less of a role in the decisions consumers make, and that winery CEOs are showing less inclination to tailor their winemaking to suit the palates of a handful of critics and reviewers. Jack Heeger reported in the Napa Valley Register that Scion Advisors, a Napa Valley research firm, conducted a survey of 500 wine business leaders to see if they thought that ratings helped to sell wine. I was surprised when the respondents were almost equally divided on the issue. 32% said the influence of ratings on consumers was the same as it was 5 years ago. 32% said the influence of ratings on consumers was greater than it had been 5 years ago. And 36% said that the influence of ratings was less than it was 5 years ago. Happily, 61% said that they "would not pursue a strategy specifically to increase scores." As you know, I don't do scores on this blog. Crafty folks who frequent CellarTracker can probably find my scores there, and folks on Snooth will see my scores turned into stars for some of my tasting notes that have been added from CellarTracker to their growing database. Here, though, I've never felt that they were appropriate. I'm neither a professional, nor an expert. I'm just a dedicated amateur. But some in the blogosphere have been trying to get wine bloggers to join together under a common standard of ratings to increase our power with respect to the big critics and the big mags. And they make some good points about the value of a similar evaluation standard across the wine blogosphere. But the survey results make me wonder if bloggers need to make this step. Te popularity of wine blogs indicates that consumers are finding alternative sources for wine information. Wine enthusiasts are finding wine bloggers, and wine bloggers are already shaping wine buying habits. More importantly, I don't agree with the fine details of the proposed ratings system, where 2 stars is an "average" wine. I drink a lot of "average" wine that I think is a pretty good buy and report on it on this site, but I can't imagine that 2/5 stars would encourage anyone to buy it. What do you think? Would you find this blog more useful if I added a 5-star rating system to my QPR notation? You know I believe that wine scores of any sort tend to give wine reviews a false sense of objectivity in what is, after all, a completely subjective experience. All things considered, and much as I usually throw my hat in the blogging ring when a new idea comes about, I'm not inclined to make this move. But I'd be interested in hearing your thoughts on this issue. In honor of the 3rd anniversary of Wine Blogging Wednesday, I'm featuring "naked" or unoaked wines this week. You'll be able to see my reactions to an unoaked chardonnay (the theme for this month's event) on Wednesday, but to get us started I've got a review of an unoaked pinot noir from the Russian River Valley. Yes, an unoaked pinot noir. SoloRosa Winery, which is known more for its roses than its reds, is now bottling a wine made from pinot fruit from the Russian River Valley AVA that has never seen the inside of an oak barrel. Labeled "Piccolo Rosso" ("little red" in Italian) this wine can best be described as halfway between a cru beaujolais and a pinot noir. Lighter in color and texture than a pinot noir, but with a bit more meatiness than most beaujolais, I found it to be a nice change of pace. Even better, it is under $20! Everything about the 2006 Solo Rosa "Piccolo Rosso" Pinot Noir ($17.99, domaine547) reminded me of cherries. First, it was cherry-colored in my glass, and the edges tended to fade away towards a translucent rose that was more pale than I'm used to seeing in pinot. Then, aromas of cherry were accompanied by a faint whiff of rose petals and even a touch of cinnamon. Finally, the flavors were fruity and herbal with cherry and rhubarb predominating and a bit of meatiness coming through on each swallow. Without the oak, this wine was not as silky as the pinot noirs I'm used to, and the texture and good acidity of this wine reminded me strongly of a gamay wine. At a time when most pinots are very expensive, and cru beaujolais can be hard to find on the west coast, this wine represented good QPR . This wine would be a refreshing choice if you are looking for something to serve with BBQ, pizza, pasta with red sauce, or even French onion soup. I caramelized some onions, threw a few tablespoons of sherry and some thyme into the pan, and combined it all with beef stock before loading it into a crock with some cheesy toasts to top off and it was a very nice combination. The sweet onions drew out the sweetness of the cherry fruit, the beef stock picked up its meaty notes, and the thyme and rhubarb flavors worked well together and accentuated the wine's herbal qualities. Most of all, the wine didn't overwhelm the subtle flavors of soup. Check back on Wednesday for more unwooded bliss for WBW #36! If you are traveling in the Sonoma wine country and are making a stop in the charming town of Healdsburg, make sure to leave some time to visit The Wine Shop. When I stopped in recently, owner Mark Friedrich was there and it was one of the most enjoyable wine shopping trips that I've had in some time. The Wine Shop is a wine shop lets you taste before you buy, just like Hillaire Belloc advised in 1935. There is a small tasting bar, and Mark had an array of about a dozen wines up on the bar. Four pours were $10, and you could take your pick from among the wines on offer. I really liked having the opportunity to mix and match the wines I wanted to taste, and decided to focus on local bottlings, along with a wine I've been wanting to try. 2006 Leo Steen Chenin Blanc Saini Farms ($17) A dry, dry wine with crisp acidity, loads of citrus, and a bracing finish. Good QPR. 2006 Saxon Brown Semillon Cricket Creek ($20). Melon and peach aromas and flavors with citrus notes make for an excellent dry semillon that is far less flabby and has more focus than many domestic bottlings of this varietal. Excellent QPR. 2005 Cep Pinot Noir Sonoma Coast ($29). Extraordinary aromas of blackberry, chocolate and a tinge of coconut are the leading edge of this rich, blackberry-flavored wine. Dusty tannins are still fairly evident, so it may be even better in 6 months time. I liked this wine a lot, but it won't be to everyone's taste. Very Good QPR. 2004 Niepoort Douro Vertente ($29). Aromas and flavors of bitter almond with smooth red fruits, lots of structure from a good backbone of acidity. Will get even better with age, but it is drinking very well now. Very Good QPR. After tasting I had a browse around the store, which was full to the brim of great Sonoma County bottlings that you just aren't going to see everywhere. They come from small production wineries, and are picked with real care. There was a great selection of syrah, pinot noir, and zinfandel, which is understandable given the local growing trends, but the shop also has a wide selection of high-end cabernet and chardonnay, too. The imported wine selection is small, but a store that stocks Portuguese table wine is doing just fine in my books! They also have some wine accessories like Wine-Away (in the handy pocket size, perfect for traveling in the wine country), cans of inert gas, and corkscrews. 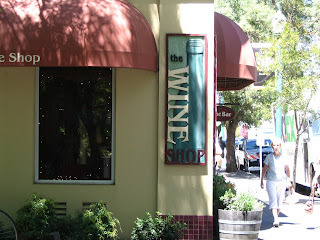 The Wine Shop is located on Healdsburg Avenue just as you reach the square, which makes it a perfect spot to stop off after having lunch or doing a bit of shopping. The store ships wine to states that allow it, so you won't have to schlep your wine on the plane. You will enjoy talking to Mark as I did, or his associate Pedro Rusk. Sitting at their wine bar, listening to the conversations as folks chose their wines, and learning about Sonoma County wine was a real pleasure. I know I'll be back there soon. In 1935, Huey Long was assassinated in Louisiana, Fred Perry won Wimbledon, It Happened One Night won the Academy Awards for Best Picture, and the Nazis enacted the Nuremberg Laws against the Jews. Also in 1935 Miss Bridget Herbert got married, and to celebrate her nuptials Hilaire Belloc (1870-1953), the famous essayist and poet, penned a small book that contained classic advice on wine and housekeeping. Dipping into it in 2007 is a treat, and reminded me how much has changed in the world of wine, and how some things remain the same. Like most wine lovers, Belloc was a man of strong opinions. The book opens: "Never warm Red wine. This deleterious practice is called by the vulgar 'taking the Chill off.'" Over the course of 37 pages Belloc discusses corkscrews, how to baptize wine, how to remove bad corks, where and how to buy wine, how to bottle it, and a score of other topics. He is a fan of white wine from Orvieto, and red wine from Burgundy. He likes his champagne with a bit of sweetness, and his white wines not to be served too cold. Nothing but sea salt touched his food, and his coffee-making standards were so high I imagine he never had a cup that satisfied him. Reading Belloc's book of advice gives us a glimpse into a lost world of wine, where consumers tasted wine from merchant barrels before being bottled and where it was even conceivable that you might have a bottling operation in your own cellar (provided you could find 6 friends to help you and some garden trellis to temporarily hold the bottles). 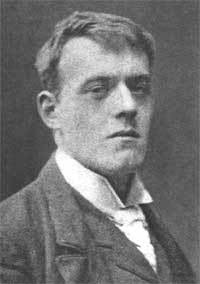 Belloc mentions long-dead wine merchants by name who he trusted to sell him the same wine in bottles that he had tasted from the barrel. He instructs Miss Herbert to stay in room 90 at the Hotel des Voyageurs in Nantes when she goes to visit his favorite wholesaler to buy French wine. And he put a lot of stock in the purchasing power of Mr. Heath who ran the wine department for the Army and Navy stores. 72 years on, it is hard to follow some of his advice ("never buy anything you have not tasted"), while some seems timeless and relevant ("divide your buying of wine into two clear departments 1) buying ordinary wine 2) buying special wine"). This mixture of past preoccupations and classic concerns is what makes this book so fascinating. In 1960, Belloc's friend Evelyn Waugh got permission to reprint the slim volume under the simple title Advice, and though it is out of print today you can still find copies (as I did) on Alibris for around $20. The book is beautifully bound, and printed in two inks (red and black) with reproductions of Belloc's original pen and ink sketches. If you need a gift for a wine lover (or for yourself) and enjoy taking a peek into the past, I highly recommend this book. It's been a while since I've opened one of my precious bottles of Burgundian pinot noir to continue my novice exploration of the region and its wines. Burgundy makes me anxious--and one of this year's wine resolutions was to start learning about the wines so that I don't break into a cold sweat whenever I see one in the store. So far I've been drinking wines from a single maker (Vincent Girardin, bottled under the "Baron de la Charriere" label for the European market) and a single vintage (2000). I bought my Burgundies back in January from Chronicle Wine Cellar, and have so far opened the Volnay (which taught me a lot about how balanced Burgundy can be) and the Nuits St. Georges (which was all about how a wine could develop and change from one glass to the next). Tonight it was time to venture into the region achored by the French commune of Aloxe-Corton in the Cote de Beaune. 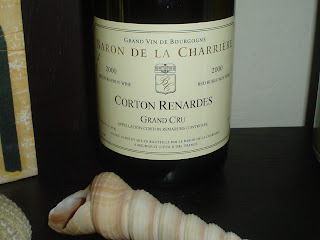 Known for its whites (Corton-Charlemagne) as well as its reds (the Corton Grand Crus), this wine comes from the subdivision of Corton Renardes. As with all of my previous adventures in Burgundy, the 2000 Baron de la Charrière Corton Renardes was a simply amazing pinot noir (Chronicle Wine Cellar, $24.95; Rosso Wine Shop, $39.99). What stood out about this wine was its persistence. This wine had the longest finish imaginable, but the real charm of it was the way in which the aromas stuck with you from the first sniffs to the last whisper in your mouth. It was a beautiful dark ruby in color, just like a ripe cherry. When I first opened the bottle, I was greeted by sour cherry and blackberry fruit aromas laced with a hint of stone and mineral. The flavors involved layer after layer of cherry, black cherry, and sour cherry along with a bit of gamy meatiness that gave the wine complexity and interest. After you swallowed, your mouth continued to sing with creamy sour cherry, white pepper, leather, and chocolate. As I know next to nothing about red Burgundies, I'm reluctant to make any kind of grand pronouncements about this wine other than these. For $24. 95, this represented excellent QPR. If I had paid $40, I would still not feel ripped off in the slightest. Burgundy makes great, thoughtful pinot noirs and I can see why some people are obsessed with them. Every bottle I drink is a revelation, and every bottle I drink makes me want to buy more. Happily I have another bottle of this, which I plan to open next year so that I can see what another year of age does for it. It's pretty hard to imagine this wine getting better, but check back next July and see.